Small businesses are more likely to be reviewed by the taxman after HMRC admitted that one in ten small businesses is under investigation as it attempts to recoup uncollected taxes from 2015-2016. Should HMRC decide to investigate your business records, it will usually call asking questions to ensure you are meeting legal responsibilities. This conversation will help it determine whether you can submit an accurate tax return, if further action is required, if additional help and support is needed or if a face-to-face visit is required. 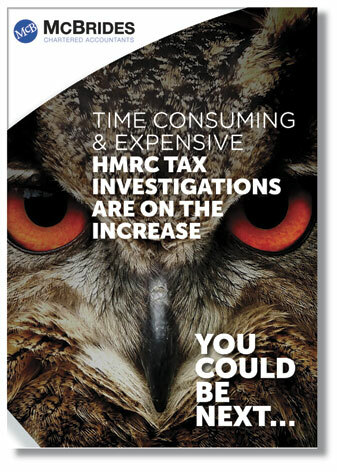 If HMRC deems a face-to-face meeting necessary, it will agree a date and time with you, although we have heard about some instances where inspectors have turned up unannounced. Please remember that you are not obliged to meet with them if this is the case as it’s highly unlikely to be at a convenient time. You are also entitled to have time to prepare for what can be a lengthy visit. Unfortunately, no-one can predict if or when HMRC might decide to have a closer look at your business affairs, but such intrusion is costly to deal with and you will need to take professional advice to help you manage HMRC’s questioning. McBrides offers all clients a fee protection insurance known as ‘eXtra’ to help cover our fees should HMRC select your business for review. 'eXtra' is an annual insurance product with premiums linked to your business turnover. The premium also covers the self-assessment tax returns of directors and/or company secretaries and their spouses or civil partners where McBrides prepare these. If any of these people have rental income exceeding £50,000, a separate 'eXtra' fee, at the appropriate rate, is required. It also includes access to free HR, health and safety and legal advice, which is invaluable to growing businesses. In 2016, one of our clients decided not to renew their cover but then became subject to a detailed enquiry, which has only just concluded. That client is currently about £10,000 out of pocket by not renewing. If you would like further information about 'eXtra', then please contact shirley.caddock@mcbridesllp.com. If you would like further information about what to do in the event of an HMRC review, then please contact terry.baldwin@mcbridesllp.com.